Heat oven to 350° F. Spray 3 (8-inch) round cake pans with cooking spray. In large bowl, beat cake ingredients with electric mixer on low speed 30 seconds. Beat on medium speed 2 minutes. Pour batter into pans. Bake 18 to 20 minutes or until cake springs back when touched lightly in center. Cool 10 minutes; remove from pans to cooling racks. Cool completely. Place 3 cups frosting in separate bowl; stir in pink food color. Divide remaining frosting (about 1 cup for each color) among 5 bowls; tint with remaining food colors. Trim rounded tops off cakes to level, if needed. On serving plate, place 1 cake layer. Spread with pink frosting to within 1/4 inch of edge. Repeat with remaining cake layers. Spread thin layer of frosting on top and side of cake to seal in crumbs. Spoon 1 color frosting into decorating bag fitted with #12 tip. Pipe row of straight dots on cake from top to bottom. Gently spread each dot with offset pastry knife, cleaning knife after each time. 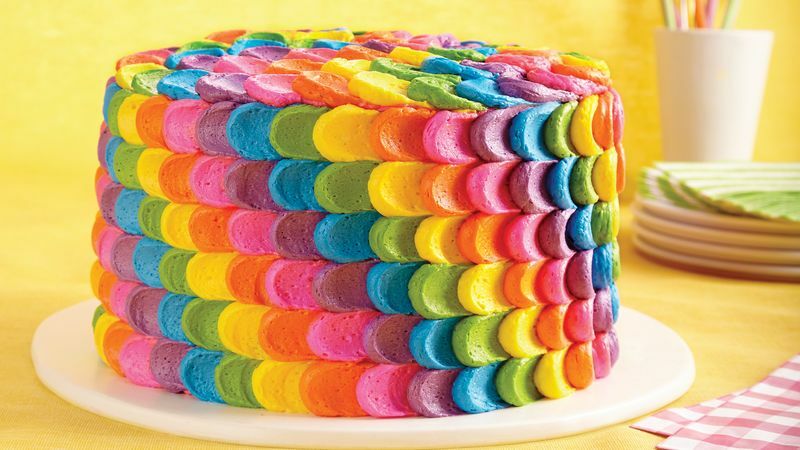 Repeat with remaining colors of frosting. Create another row of dots where frosting ends and spread each dot with knife. Repeat until whole cake is finished. When scallops end, add final row of dots to "seal" the seam. Pipe top of cake with one dot at a time; spread and then pipe again, creating a concentric circle.